The HLK-SRT-80300 Size Reducing Tool is a hybrid derivation of our standard HLK-RHD5 Manipulator Arm and HLK-33600 Cutter mounted on a common beam. The system also incorporates 2 of our standard HLK-72100 7 Function Valve Packs. 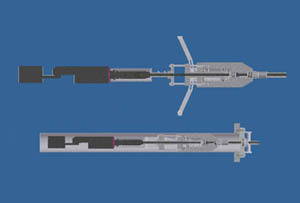 The HLK-SRT-33300 is a purpose designed Cutter / Grab Tool which can be deployed into waste storage ponds or chambers. It can grab and clamp around pipes, cables, scaffolding, trunking and general debris and cut it into manageable size pieces for disposal. Maximum jaw opening is 150mm. 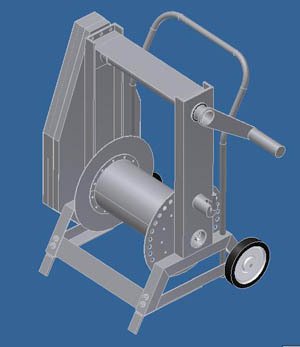 The portable winch is primarily for use with the underground camera deployment system, HLK 82320. The frame is contstructed from stainless steel to create a durable product that can be transported anywhere necessary on site. Designed as a cost-effective option for installation on suction anchors. These spool valves can be configured as open/shut or three-position change over units. Pipe size from 1" to 12" or even bigger if required. Constructed in 316SS Delrin, each of these units can be remotely operated using HLK 1300 series pistons.